If you’ve ever ridden your motorcycle in a group before, you may have had a less-than-happy experience where tensions started to rise, and maybe you needed a little time apart from the group after the ride starts. You know the kind of rides I mean ... where as soon as you get to lunch you check your phone hoping for some minor emergency so you can exit gracefully and ride back solo. The success or failure of a group ride largely has to do with the riding etiquette (or lack thereof). 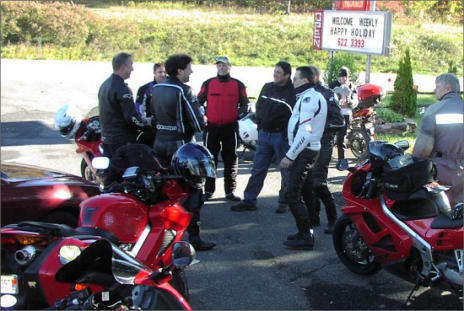 While some groups share what’s expected of members when it comes to following traffic laws, riding staggered, hand signals, etc., many times what ultimately determines the fun the group has is decided by the often unspoken group riding etiquette rules. The following are the top 10 rules I’ve found that make or break a ride based on trial and, unfortunately, a boatload of error on my part. 1. Be on time. There is no such thing as being fashionably late when riding with groups. "Early is on time. 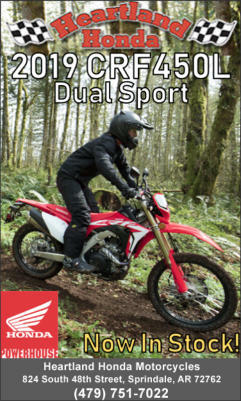 On time is late.” When riding with a group, especially a new group, it's important to be respectful of everyone’s time. Most riders have limited time on their motorcycles. There are few things more annoying than waiting around at a smelly gas station for a straggler. And nothing will get you uninvited to a “private group ride” more quickly than being chronically fashionably late. 2. Come prepared with the route details. Unless the route is a complete mystery or you’re under the age of 10, don’t ask repeatedly, “Are we there yet?” If you want play-by-play information such as how long until the lunch stop, potty break, or the destination, invest in a GPS or print a copy of the route and bring it with you. Many ride leaders put a good deal of work into creating and sharing the route in advance. 3. Know where to ride in the pack. Rider placement in a group is important and different groups do things differently. Some groups prefer to put the most relaxed or inexperienced rider behind the ride leader and other groups prefer to put her at the rear in front of the sweep. I showed up to a ride once where I was clearly 35 years younger than everyone else. I saw the AARP cards and wanted to impress the group so I placed myself toward the front. Big mistake! As soon as we got to the first twisty (barely a bend in the road) I was promptly “schooled” and had to wave four riders up or risk getting run over. Don’t assume because you’re a fast rider in your familiar riding group that you belong in the front with a new group. Better to be polite than cocky. 4. Gauge break lengths by the leader’s actions. If the leader hasn’t communicated how long the break will be, observe her actions. If she takes off her helmet, chances are you can take yours off too. Conversely, if she leaves her helmet on that's a good indication it’s a quick regroup or “gas-and-go” break. You should leave your helmet on too or risk getting death stares from your fellow riders as they wait for you so the adventure can continue. 5. Be ready to saddle up at the end of a break. A big no-no is after the leader has announced it’s time to saddle up, light up a cigarette, run in to get a coffee, or decide you changed your mind and need a mother nature break after all. I kid you not, I’ve seen this on several rides and few things cause angst in a group faster than waiting around for someone to finish their coffee or cigarette. If you need frequent long breaks then take the initiative to form and lead group rides with other like-minded/like-riding- style gals. And for those with small bladders (like me) try either cutting back on the caffeine or enjoying your coffee several hours before you are scheduled to ride so you aren’t having to stop more frequently than the rest of the group. 6. Don’t get in front of the ride leader. I have to admit I’ve been guilty of this on a few occasions. In my defense, the twisties are like a siren’s call and before I know it I have a bee in my bonnet and I’m zipping past my buddy leading the ride. Unfortunately, my bee is directionally challenged and often flies the wrong direction. I actually have some GoPro footage of the head-shakes I got after I circled back and found my group waiting at the turn I missed. I’m lucky my middle-aged gal pals didn’t jump me. 7. Be flexible. Some of the best times I’ve had have been when things haven’t quite worked out the way we planned. Whether it’s finding out the lunch spot is closed, the route gets detoured, or someone gets a flat, attitude is everything when riding with a group. 8. See something, say something (privately). As much as us moms and grandmas like to believe we have eyeballs in the back of our head, when leading big groups it can be hard to see all the way to the last rider. If you see something the ride leader needs to know, pull her aside and share it with her privately. For example, if you notice that some riders are having a hard time with spacing or maintaining their speed, it could be an indication that they’re fatigued and the group needs a break. The leader needs to know. And by all means if you see something that impacts the group’s safety such as drug or alcohol consumption, speak up. You never want a group excursion to end with an ambulance ride or worse! Tact and diplomacy are the key; how you say something is as important as what you say. 9. Ride your own ride. Remember you’re not on a bus. Set your own pace and ride your own ride. You only have yourself to blame if you find yourself riding above your abilities. If you fall behind many groups have a policy of regrouping at designated spots or waiting at turns so most of the time you will not be left behind. However, if I’m joining a new group I make sure I’m familiar with the route and know where the ride ends. One time I didn’t do this and got separated from the group and missed a great dinner and worried the ride leader. 10. Saying thank you goes a long way. A lot of work goes into organizing a ride, creating a route, producing GPS files and maps, picking lunch destinations, promoting the ride, and leading it. Expressing your appreciation for the organizer’s hardwork is one way to be invited again. Be sure to thank the sweep as well. Done right, the sweep’s role is a tough job. Critique privately but give accolades publicly whenever possible. Even if the ride didn’t quite meet your expectations, thank the leader and keep your criticism to yourself. As moms are fond of saying, “If you don’t have something nice to say then don’t say anything at all.” Great riding groups are a gift. Here’s wishing you lots of presents! If you’ve ever ridden your motorcycle in a group before, you may have had a less-than-happy experience where tensions started to rise, and maybe you needed a little time apart from the group after the ride starts. You know the kind of rides I mean... where as soon as you get to lunch you check your phone hoping for some minor emergency so you can exit gracefully and ride back solo. The success or failure of a group ride largely has to do with the riding etiquette (or lack thereof). 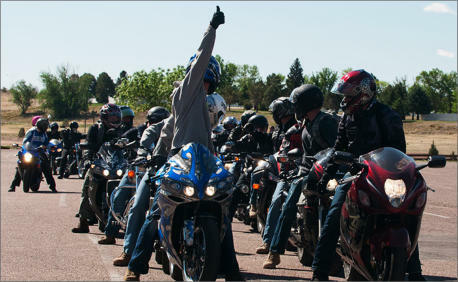 While some groups share what’s expected of members when it comes to following traffic laws, riding staggered, hand signals, etc., many times what ultimately determines the fun the group has is decided by the often unspoken group riding etiquette rules. The following are the top 10 rules I’ve found that make or break a ride based on trial and, unfortunately, a boatload of error on my part. 1. Be on time. There is no such thing as being fashionably late when riding with groups. "Early is on time. On time is late.” When riding with a group, especially a new group, it's important to be respectful of everyone’s time. Most riders have limited time on their motorcycles. There are few things more annoying than waiting around at a smelly gas station for a straggler. And nothing will get you uninvited to a “private group ride” more quickly than being chronically fashionably late. 2. Come prepared with the route details. Unless the route is a complete mystery or you’re under the age of 10, don’t ask repeatedly, “Are we there yet?” If you want play-by-play information such as how long until the lunch stop, potty break, or the destination, invest in a GPS or print a copy of the route and bring it with you. Many ride leaders put a good deal of work into creating and sharing the route in advance. 3. Know where to ride in the pack. Rider placement in a group is important and different groups do things differently. Some groups prefer to put the most relaxed or inexperienced rider behind the ride leader and other groups prefer to put her at the rear in front of the sweep. I showed up to a ride once where I was clearly 35 years younger than everyone else. I saw the AARP cards and wanted to impress the group so I placed myself toward the front. Big mistake! As soon as we got to the first twisty (barely a bend in the road) I was promptly “schooled” and had to wave four riders up or risk getting run over. Don’t assume because you’re a fast rider in your familiar riding group that you belong in the front with a new group. Better to be polite than cocky. 4. Gauge break lengths by the leader’s actions. If the leader hasn’t communicated how long the break will be, observe her actions. If she takes off her helmet, chances are you can take yours off too. Conversely, if she leaves her helmet on that's a good indication it’s a quick regroup or “gas-and-go” break. You should leave your helmet on too or risk getting death stares from your fellow riders as they wait for you so the adventure can continue. 5. Be ready to saddle up at the end of a break. A big no-no is after the leader has announced it’s time to saddle up, light up a cigarette, run in to get a coffee, or decide you changed your mind and need a mother nature break after all. I kid you not, I’ve seen this on several rides and few things cause angst in a group faster than waiting around for someone to finish their coffee or cigarette. If you need frequent long breaks then take the initiative to form and lead group rides with other like-minded/like-riding-style gals. And for those with small bladders (like me) try either cutting back on the caffeine or enjoying your coffee several hours before you are scheduled to ride so you aren’t having to stop more frequently than the rest of the group. 6. Don’t get in front of the ride leader. I have to admit I’ve been guilty of this on a few occasions. In my defense, the twisties are like a siren’s call and before I know it I have a bee in my bonnet and I’m zipping past my buddy leading the ride. Unfortunately, my bee is directionally challenged and often flies the wrong direction. I actually have some GoPro footage of the head-shakes I got after I circled back and found my group waiting at the turn I missed. I’m lucky my middle-aged gal pals didn’t jump me. 7. Be flexible. Some of the best times I’ve had have been when things haven’t quite worked out the way we planned. Whether it’s finding out the lunch spot is closed, the route gets detoured, or someone gets a flat, attitude is everything when riding with a group. 8. See something, say something (privately). As much as us moms and grandmas like to believe we have eyeballs in the back of our head, when leading big groups it can be hard to see all the way to the last rider. If you see something the ride leader needs to know, pull her aside and share it with her privately. For example, if you notice that some riders are having a hard time with spacing or maintaining their speed, it could be an indication that they’re fatigued and the group needs a break. The leader needs to know. And by all means if you see something that impacts the group’s safety such as drug or alcohol consumption, speak up. You never want a group excursion to end with an ambulance ride or worse! Tact and diplomacy are the key; how you say something is as important as what you say. 9. Ride your own ride. Remember you’re not on a bus. Set your own pace and ride your own ride. You only have yourself to blame if you find yourself riding above your abilities. If you fall behind many groups have a policy of regrouping at designated spots or waiting at turns so most of the time you will not be left behind. However, if I’m joining a new group I make sure I’m familiar with the route and know where the ride ends. One time I didn’t do this and got separated from the group and missed a great dinner and worried the ride leader. 10. Saying thank you goes a long way. A lot of work goes into organizing a ride, creating a route, producing GPS files and maps, picking lunch destinations, promoting the ride, and leading it. Expressing your appreciation for the organizer’s hardwork is one way to be invited again. Be sure to thank the sweep as well. Done right, the sweep’s role is a tough job. Critique privately but give accolades publicly whenever possible. Even if the ride didn’t quite meet your expectations, thank the leader and keep your criticism to yourself. As moms are fond of saying, “If you don’t have something nice to say then don’t say anything at all.” Great riding groups are a gift. Here’s wishing you lots of presents!